By means of cryptography and distributed algorithm,「Blockchain Technology」is regarded as the most subversively innovative technology since the invention of the Internet. On the Internet where a trusting relationship is difficult to build,「Blockchain Technology」can make participants reach a consensus without the help of a third-party center, solving the problem of trust at a very low cost. Therefore, 「Blockchain Technology」has a huge application value in the fields of「finance」,「energy」and 「food safety」, etc. Trust is the foundation of group, organization, nation and society. We depend on each other and work together, and now we are here. Trust 1.0: The most primitive form of trust, it comes from familiarity and closeness (such as trust for relatives) and also from fear and uncertainty (such as trust for deities). Deeply affected by hormone secretion, it appeals to individual emotions that is difficult to be judged. Trust 2.0: It is a growing concentration of power and wealth based on trust 1.0, which has become the huge religious and political collection (such as empires and the Holy See). Those distant cores have become the objects of trust; however, they usually fail to survive. 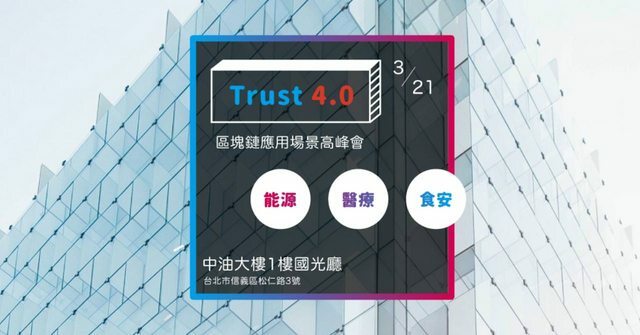 Trust 3.0: The successive establishment of democratic politics, enterprise management, financial system and supervisory laws and regulations and the fast development of technology have boosted the new centralization. Yet, a great amount of regulations can’t restrain the possibilities brought by the accelerating evolution of technology. The public gradually lose confidence for the power excessively concentrated in a few specific institutions and the excessive intermediation caused by centralization. Trust 4.0: Technological advances in algorithms make it no longer necessary for trust to be built upon institutional endorsements. The virtual currencies boom has not only led to the application of Blockchain algorithms and smart contract, but it is also rapidly reversing the trend of centralization. From energy to finance, and from healthcare to food safety, etc., the centralized system seems to be stable but opaque. Can Blockchain really be the infrastructure for the next era of trust? To find out what the future of the Blockchain is, do not miss this summit! BlaBlaBlock will hold more workshops about「Blockchain Technology」. Please visit the BlaBlaBlock fan page for more information. BlaBlaBlock (BBB) is committed to analyze the development and influence of Blockchain technology with the professional knowledge of politics, economics, philosophy and sociology, etc. Currently, The hot trend in digital currency and the media effect have brought about mixed, reproduced news on the Internet, while the cluster around digital currency mining, investment and price fluctuation. In such a media environment, we sincerely hope to provide readers with different perspectives in broader fields of knowledge, moreover,to inspire our readers to be insightful in regards to Blockchain and its related applications. BBB now offers in-depth topics and interviews with experts in related fields, and irregularly organizes activities that are opportunities for readers to participate, discuss and gain a thorough understanding.